It wasn’t a complete flop but I rushed through it, failing to execute the preschool-mastered skill of color order. Yes, it still tasted good and fit in with the whole St. Patrick’s day theme that weekend, but I knew I’d need to try it again when I could devote the time and patience it took to not screw it up. 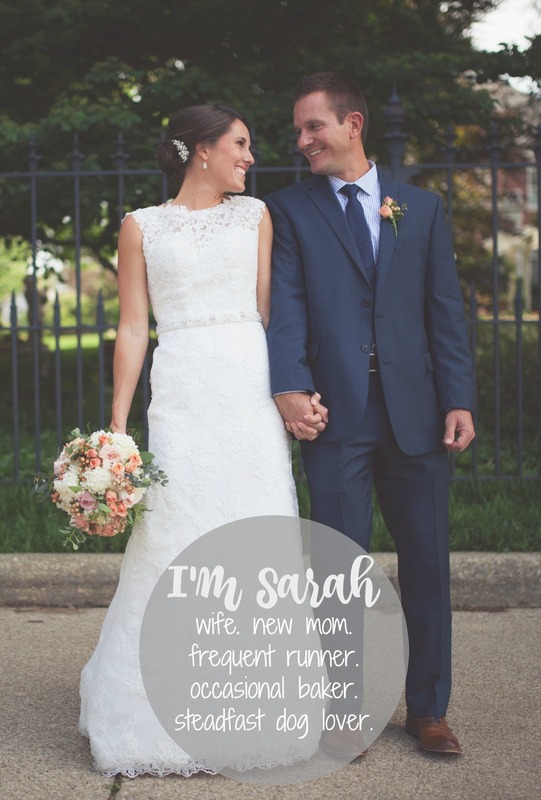 So in celebration of Matt’s birthday this week I decided to give it another shot. My first tip with making this cake is to do it on a Sunday afternoon when you have no commitments other than careful measuring and wait time. If you’re anything like me, you often try to multitask when you cook and bake. This is not the cake to do that with. 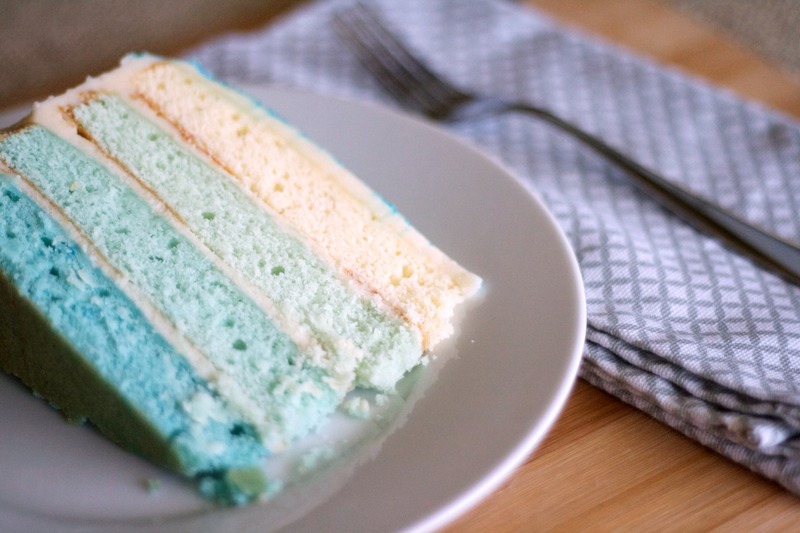 This layer cake is a special occasion type of cake because it is equal parts time-consuming and indulgent. 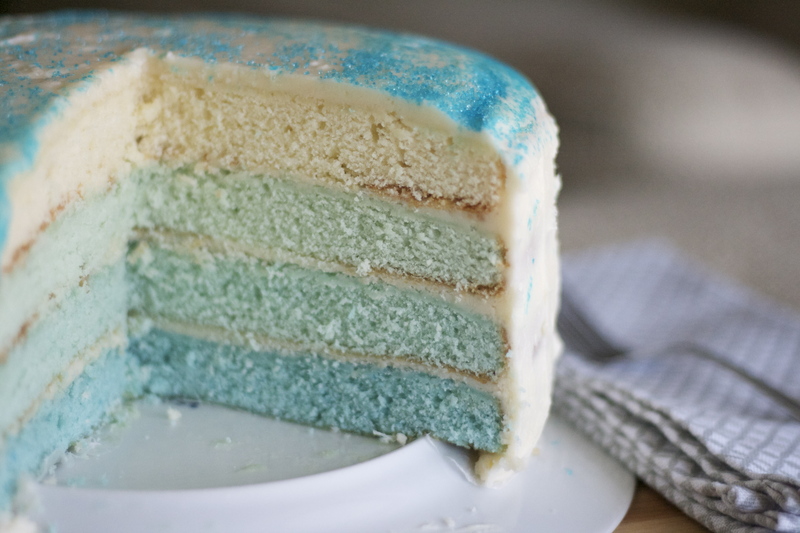 From the cake to the buttercream icing, there’s no shortage of butter and that’s a good thing. Throw out your paleo/whole/vegan/healthy eating plan for enough time to eat a slice. You can thank me later. Preheat oven to 350. Ideally this is the time to grease and flour all four of your cake pans. Oh you don’t have four cake pans? Me neither. Grease and flour two of them and set aside. In a stand mixer, whip butter until light and fluffy. Add sugar 1 cup at a time. Add eggs one at a time until each is combined. Add dry ingredients into wet one cup at a time, alternating between milk mixture and flour. Try not to overmix. Place four medium bowls out on your counter. Divide batter into each bowl evenly. For me it was just under 2 cups of batter per bowl. Add no food coloring to the first bowl. I like to use gel food coloring as I find it’s a little more accurate. Add one toothpick of color into the second bowl and mix until combined. Two for the next and closer to four for the final one. 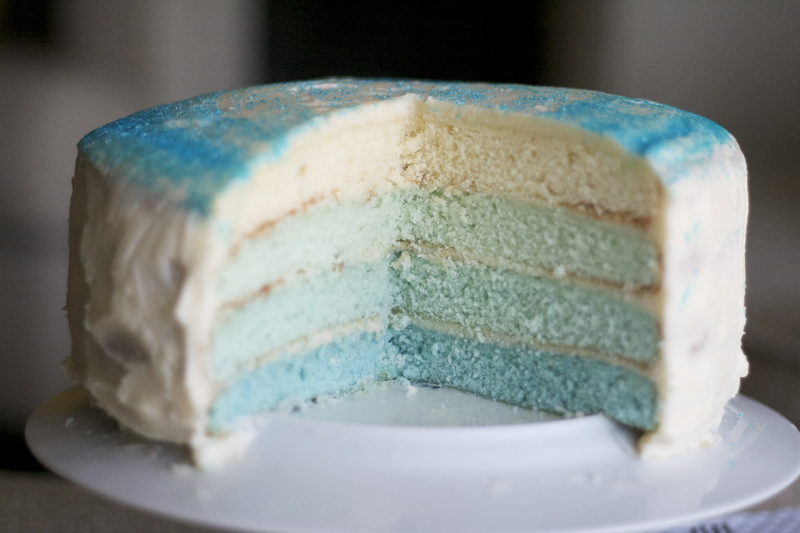 The key here is to only mix the batter until the color is combined as the colored layers already tend to be a little tougher than those that aren’t. Need another photo to take a break from the instructions? Me too. 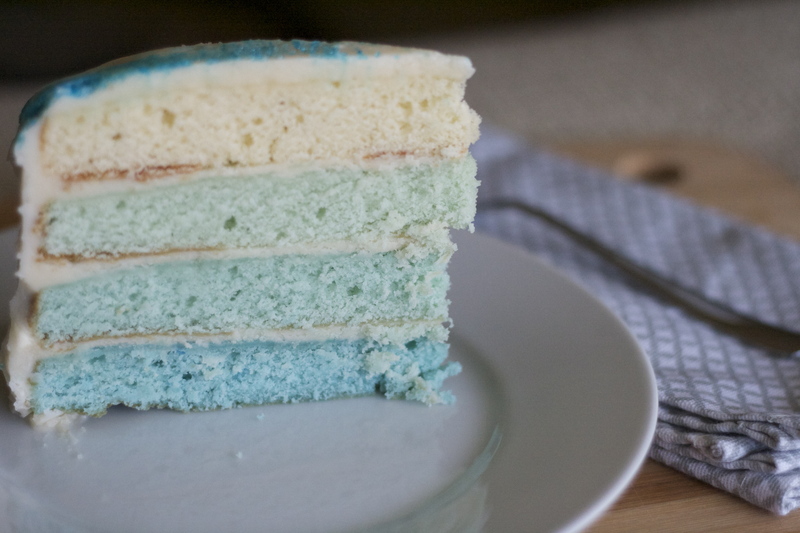 Once your layers are colored, pour the first two into your two baking pans and bake for 20 minutes or until a toothpick comes out clean. 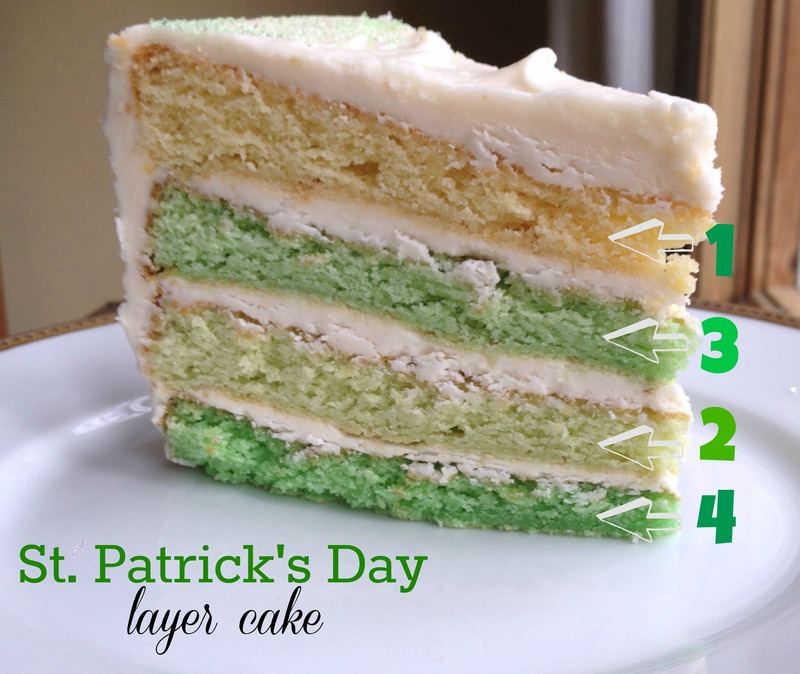 These layers are thin so they will cook relatively quick. Remove from oven and let cool on rack for 5-10 minutes. Add a layer of parchment or wax paper to your rack before you flip them out of the pan to make turning easier for you when they are cool. Trust me it helps. Wash and dry your pans to bring them back to room temperature before you bake your other two layers. Once your layers are cool, wrap each of them in plastic wrap and freeze them for a few minutes. this will make the icing process much easier. 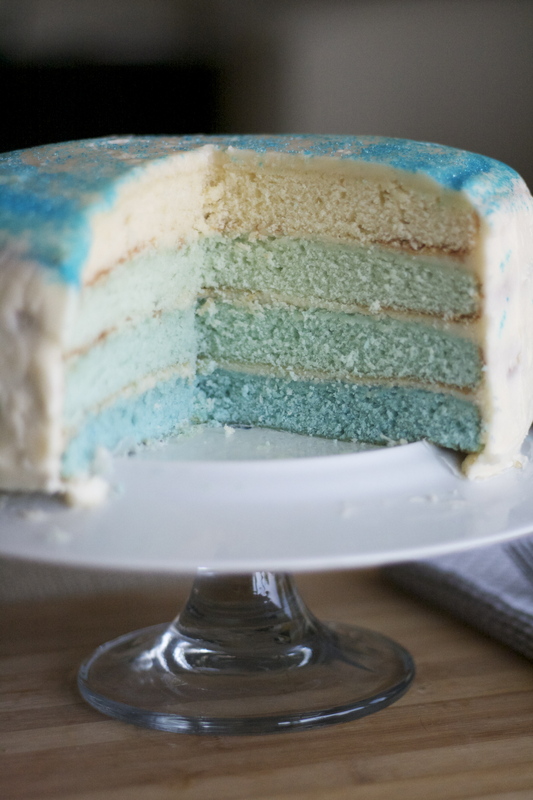 When you are ready to ice your cake, check your layer order several times before you place them on your cake stand. Trust me. The two middle layers look a lot a like and can be very deceiving. 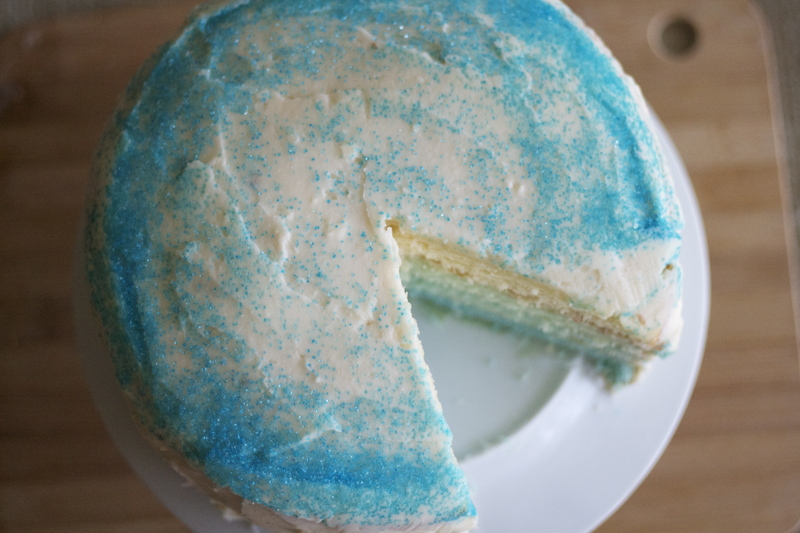 Do a rough ice and then finish it off with, you guess it, more buttercream. I like to keep this cake in the fridge between servings because let’s face it, it’s going to take you at least a week to eat it all. Offer it up to friends or strangers that you just met. 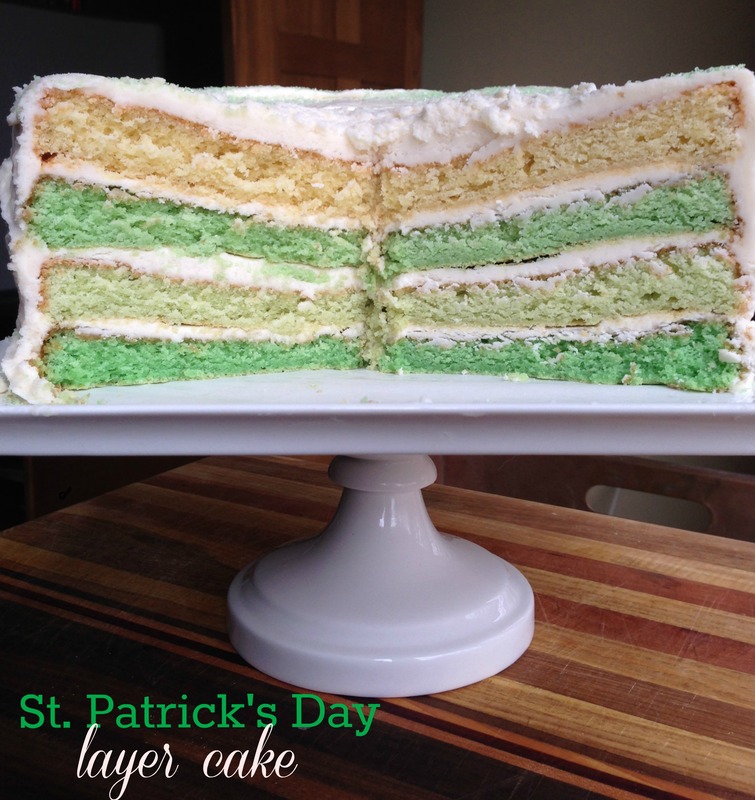 Everybody loves a good layer cake. 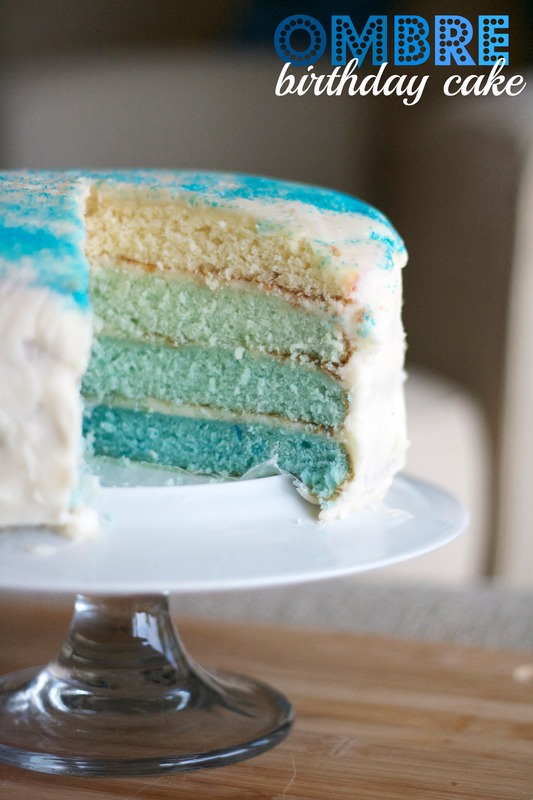 Is it all right for me to use your picture of your blue ombre cake? I’d just ask that you link back to my blog and give photo credit but you are welcome to use the photo.